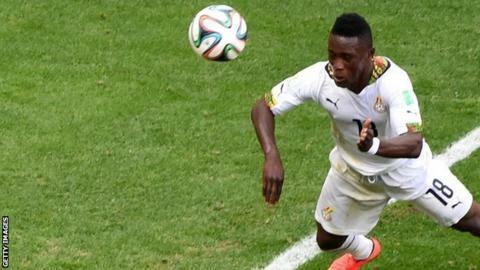 Ghana striker Majeed Waris has revealed he chose to sign for Turkish side Trabzonspor because of their ambition. Waris, 22, joined on a four-year deal from Russians Spartak Moscow on Monday after rejecting other interested clubs. "I'm impressed with the players they have and the management convinced me with their set-up and plans - I'm really excited," Waris told BBC Sport. "A good motivation is that the club is challenging for both European and domestic titles." Waris spent the second half of last season on loan at French side Valenciennes, where he scored nine goals in 16 games, and is relishing the chance to prove himself at a new club in a new country. "This is the place I want to be and God willing I hope to succeed here," he added. "I'd like to thank Spartak Moscow for their support, now I am looking forward to the next phase here in Turkey." Waris is also eager to put behind him a disappointing World Cup campaign with Ghana. The four-time African Champions finished with only one point from their three Group G games in Brazil and were also embroiled in a dispute over appearance fees. "Things didn't work out in Brazil but I think we've all learned a bitter lesson from that tournament," he said. "We owe the country and our fans a better performance, conduct and result starting with the qualifiers." The Black Stars' will host Uganda on 5 September in Kumasi and take on Togo five days later. The top two from each group and the best third-placed team will join hosts Morocco for January's Africa Cup of Nations finals.